International mechanisms for the control and responsible use of alien species in aquatic ecosystems. Report of an Ad Hoc Expert Consultation. Xishuangbanna, People's Republic of China, 27-30 August 2003. Aquaculture in the Mekong basin: alien or indigenous species? Extension of aquaculture techniques in the lower Mekong basin has in the past promoted alien species, which has led to alien species currently dominating small-scale aquaculture. The reasons for this included a general lack of knowledge on the biology of indigenous species and the associated absence of domesticated aquaculture strains. Therefore, using established alien aquaculture species was expedient since seed production and culture systems could easily be extended without the need for much additional research. By importing suitable strains the domestication process could be bypassed. Further, alien species were often perceived as more profitable for small-scale farmers. The Mekong Basin is endowed with a rich fish fauna, estimated to consist of at least 1200 species, and possibly as many as 1700 (Coates, Ouch, Suntornratana, Tung, & Viravong, 2003). It is reasonable to assume that such a diverse fish fauna should include many species suitable for aquaculture. In fact, several indigenous species are already used for aquaculture, although generally at a basic level of domestication. Seed for some species groups, e.g. Pangasidae and Channa spp., are often collected from the wild (Van Zaalinge, Lieng, Bun, Kong, & Valbo-Jørgensen, 2002). Aquaculture is one of the main reasons for introduction of alien species to aquatic ecosystems. As much as 17% of the global aquaculture production is contributed by introduced species (Bartley & Casal, 1998). Information on environmental impacts of alien aquatic species is scattered and difficult to find, but efforts are underway to improve the availability of such information, including the DIAS database maintained by FAO (http://www.fao.org/fi/statist/fisoft/dias/index.htm and http://www.fao.org/fi/figis/Introsp/index.jsp). FishBase (http://www.fishbase.org) also includes information on introductions. Developing domesticated strains from wild fish for aquaculture purposes is time consuming. Current efforts to amend the situation include the MRC Fisheries Programme Component AIMS (Aquaculture of Indigenous Mekong fish Species). The rationale for the Component is that the use of alien species will only decrease when suitable, economically viable indigenous alternatives are available. Preliminary estimates of the relative profitability of alien vs. indigenous species in small-scale aquaculture indicate that some indigenous species are already economically viable despite the lack of progress in domestication (Figure 1). The Component supports the Fisheries Departments of Cambodia, Lao People's Democratic Republic, Thailand and Viet Nam to carry out research and development toward improved culture systems for indigenous species. AIMS cooperates with 11 aquaculture stations in the region. The current priority species are Anabas testudineus, Barbonymus gonionotus, Cirrhinus microlepis, Cirrhinus molitorella, Leptobarbus hoevenii, Hemibagrus wyckioides, Osphronemus exodon, Pangasius bocourti and Pangasianodon hypophthalmus. The introduction of alien fish species has brought considerable benefits to small-scale farmers. For example, tilapia culture has been successfully developed in the region, largely because it can be easily bred. This has made seed widely available, even in remote areas. Tilapia is also used in commercial aquaculture, but these operations depend on more domesticated strains with higher growth rates, which require more sophisticated propagation methods and rely on high grade, expensive feed. Figure 1. Estimates of relative profitability of small-scale pond culture in Cambodia. Gross Margin = Revenue -Variable Costs (labour included), i.e. excluding Fixed Costs. Culture ponds were generally stocked with several species (poly-culture). Part of the data kindly provided by AIT (Cambodia) and READ (Cambodia). One important risk with introductions of alien species is that they may be ‘invasive’, thus tending to spread prolifically and harmfully in the environment. Once an aquatic organism is established in a system like the Mekong, the introduction is essentially irreversible. In Cambodia, at least, there are a couple of examples where tilapia populations have almost entirely replaced the indigenous fish species (Nouv, Viseth, & Ouk,2003). However, in recognising the obvious risks with alien species, it is equally important to consider that almost all domesticated plants and animals that humans use are actually alien to most areas, but even so they are generally not considered invasive. Import of new diseases is another major risk associated with introductions. Information on impacts of introductions of aquatic organisms in the Mekong basin is reviewed by (Welcomme & Vidthayanon in press). The properties of an organism that determine whether it becomes invasive or not in a particular environment and/or at a particular time are highly complex. Adverse effects may not be immediately apparent, but may surface years or decades following the initial introduction. Further, the taxonomy and distribution of many aquatic species in the tropics are not well known, so the ability to even assess pre-introduction biodiversity is very limited. Therefore, accurate prediction of potential environmental effects from an introduction is extremely difficult. Decisions whether to introduce an organism or not are often based mainly on empirical evidence from other areas where the same or similar organisms have been introduced. Further complicating the issue is that if the environment itself comes under sufficient stress, even some indigenous species may behave as invasive nuisance organisms. Thus, there is a need for a holistic, balanced approach, which considers not only the organisms to be introduced, but also the general environmental configuration as well as temporal effects. Although there is general consensus that aquaculture using indigenous species poses less risks than using aliens, release or escape of domesticated strains of indigenous species into the wild poses a threat to biodiversity. Aquaculture organisms, except perhaps in highly controlled recirculating systems, sooner or later escape to the wild. This may be due to e.g. flooding of ponds or breaking of cages. If the local wild population of the indigenous species is large and the environment is intact, limited escapes may have negligible impact. However, if the local population is small and/or the local environment is under stress, there may be considerable effects, including modification of the genetic composition of the wild population. In his Ph.D. dissertation, Wongpathom Kamonrat showed that 75–96% of Barbonymus gonionotus samples from the Chao Phraya River, Thailand, were from hatchery populations (Pongthana, 2001). The main reason for this genetic contamination is an extensive fisheries enhancement programme, that every year releases large numbers of fingerlings of this species. In addition, the Chao Phraya river ecosystem is degraded due to a multitude of dams and other sources of environmental stress. Thus, it is likely that the natural recruitment is much reduced (hence the need to stock the river in the first place). To reduce risks, there is a need to clearly distinguish between seed production for aquaculture and for fisheries enhancement. The characteristics and genetic composition of fish seed desired by aquaculture is quite different from what is required for release into the wild. The former calls for highly domesticated strains selected for e.g. growth and disease resistance, whereas the latter must be genetically as close to the local wild population as possible. For enhancement purposes, breeding should, wherever possible, be based on locally caught, wild brooders. Many fish species in the Mekong form sub-populations, which may be separated by e.g. geographic distances or using different spawning grounds etc (Poulsen, Poeu, Viravong, Suntornratana& Tung, 2002). To enable rational management of aquaculture of indigenous species, it is recommended to establish species specific management units, which define the genetically distinct wild sub-populations of the cultured species, and thus provide a framework for determining how fish may be moved within the basin without causing undue risks to local populations. The development of aquaculture based on indigenous species will cause fewer environmental concerns. Good broodstock management is key to progress and to avoid potential pitfalls. Some indigenous fish species will most likely provide viable (economically and otherwise) alternatives to alien species. Any movement of indigenous (as well as alien) fish species must be controlled and properly considered before being carried out; such control may be facilitated by establishing management units. Thanks to Chris Barlow for suggesting improvements to the manuscript. Bartley, D. M. & Casal, C. V. 1998. Impacts of introductions on the conservation and sustainable use of aquatic biodiversity, FAO Aquaculture Newsletter no. 20 (December), 15–19 pp. (also available at http://www.fao.org). Nouv, S., Viseth, H., & Ouk, V. [this volume]. Country report on present status of alien species in aquaculture and aquatic ecosystem in Cambodia. Poulsen, A., Poeu, O., Viravong, S., Suntornratana, U., & Tung, N. T. 2002. Fish migrations of the lower Mekong River basin: Implications for development, planning and environmental management. MRC Technical Paper no. 8, 63 pp. Phnom Penh, Mekong River Commission (also available at http://www.mrcmekong.org). Van Zaalinge, N., Lieng, S., Bun, N. P., Kong, H., & Valbo-Jørgensen, J. 2002. Status of the Mekong Pangasianodon hypophthalmus resources, with special reference to the stock shared between Cambodia and Viet Nam. MRC Technical Paper no. 1, 29 pp. Phnom Penh, Mekong River Commission (also available at http://www.mrcmekong.org). Welcomme, R. L. & Vidthayanon, C. in press. The impacts of introductions and stocking of exotic species in the Mekong basin and policies for their control. MRC Technical Paper. Phnom Penh, Mekong River Commission. Papua New Guinea through its former organization, the Department of Fisheries and Marine Resources, and the Food and Agriculture Organization of the United Nations used the ICES/EIFAC Code of Practice to successfully introduce and transfer six exotic fish species into the Sepik River through the Stock Enhancement Program and the FISHAID Project. These fish were introduced into the Sepik-Ramu Basin, Papua New Guinea, from India, Nepal, Malaysia and Brazil. The introduced fish species have now established breeding populations and are contributing to improved fisheries. In the lowland floodplains of the Ramu and the Sepik Rivers the Java carp (Puntius gonionotus), Pacu (Piaractus brachypomum or Colossoma bidens), red makau (Tilapia rendalli) and Emily's fish (Prochilodus margravii) are now established. In the higher altitude streams; the snow trout (Schizothorax richardsonii), the golden mahseer (Tor putitora), now locally known as Tor and red makau (Tilapia rendalli) have established breeding populations and are contributing to fish production. The status of two fish species remain unknown: the chocolate mahseer (Accrossocheilus hexagonolepis) and the giant gouramy (Osphronemus gouramy). The successful use of the ICES/EIFAC Code of Practice in a developing country environment such as Papua New Guinea was because the protocols of the Code of Practice had scientific rigour and because the Government is party to a number of international conventions on biodiversity and accepts responsible management of natural resources as an operating principle. The limitations to applying the Code of Practice are the lack of technical and infrastructure facilities in countries that implement the protocols and the lack of substantial funding. Following the successful introductions, the follow-up impact assessments and fisheries survey to quantify the breeding fish populations is now necessary. The results of the follow-on assessments may be a further learning process for the ICES/EIFAC Code of Practice in developing country situations and for Papua New Guinea policy-making for inland fisheries development. Fish introductions and transfers can be intentional, accidental and or through natural movements across transboundary catchments after introductions or transfers have taken place. In the Papua New Guinea (PNG) experience, the 1984–1997 fish introductions were planned as part of a government intervention to improve freshwater fish production for rural communities in the Sepik-Ramu River catchments. Previous fisheries research work done by the PNG Department of Primary Industry (DPI) in the 1970s and the early 1980s showed that the Sepik River system had low fish yields. Fisheries yield from the Sepik is less than ten percent of that achieved from similar sized tropical rivers, such as those in Asia (FAO 1997). Further to this, the most productive fish in the system was tilapia (Oreochromis mossambicus). The Department of Agriculture, Stock and Fisheries brought tilapia into PNG in the 1960s for aquaculture purposes in the Sepik. The tilapia got into the Sepik River when the holding facility flooded. The common carp (Cyprinus carpio), brought in for aquaculture purposes was also accidentally introduced into the Sepik in the 1980s. Both fish species contribute to the Sepik River subsistence fish production for food and income generation. To place government mediated fish introductions and transfers into perspective, the PNG Government had specific policies for the fisheries sector. The developmental goals for the fisheries sector were: (i) to develop renewable fisheries resources, within the limits of long term sustainable yields; (ii) to invest public sector resources in economically viable small holder fisheries activities which are supposed to lead to expansion of exports and decrease in imports and are planned to maintain local food supplies and provide cash earning opportunities to small holders; (iii) to invest in improvements to national extension, planning, training, research and monitoring in order to improve the technical support offered to provincial departments in the implementation of fisheries projects; and (iv) to give priority to improve subsistence food production and nutrition programs as part of its strategy in improving rural welfare and self-reliance. The Australian colonial government Department of Agriculture, Stock and Fisheries (DASF) implemented these policies prior to the 1960s, then in 1975 onwards by the PNG Government Department of Primary Industry till 1983. In 1984, the newly established Ministry of Fisheries with its implementing agency, the Department of Fisheries and Marine Resources (DFMR) implemented these policies as the first step in recognizing fisheries as an economic sector. In 1994, another legislative change produced the National Fisheries Authority (NFA) as the statutory body implementing the inland fisheries policies and in 1998, the Fisheries Management Act, 1998 modified the NFA into a commercial authority for the Government of PNG, also known as NFA to focus on commercial fisheries and aquaculture. In inland rural areas, these goals were pursued through the initiation of aquaculture as part of agriculture development and fish stock enhancement of water bodies using introduced fish. The common carp (Cyrpinus carpio) was brought into the country for aquaculture purposes in the 1960s. Fish ponds were constructed in Aiyura, Eastern Highlands Province where the agricultural research into coffee was being conducted by the DASF and fish farming was demonstrated for village farmers. Stocking was done with the introduction of rainbow trout (Oncorhyncus mykiss) also in the 1960s in the PNG highland rivers and the introduction of the Snakeskin Gouramy (Trichogaster pectoralis) and the Giant Gouramy (Osphronemus gouramy) in the 1980s in the Central Province, a southern regional province in PNG. Aquaculture development was limited to the Highland Provinces at the time (1960s), and even then, progress was slow because fish farming was a new agricultural practice to traditional subsistence farming. The inland areas were rugged with little or no road infrastructures to allow a rural population to engage in costly aquaculture development by the government to provide fish. By the mid 1970s the aquaculture facility established by DASF still consisted of four ponds and a single scientific officer producing a small number of carp fingerlings to continue to facilitate village based fish farming. The distribution of fish to rural people through aquaculture was slow. In the coastal areas, the development of commercial marine fish stocks for exports and government subsidized artisanal fisheries were the developmental strategies. Access to extensive marine fish resources by inland communities was limited. Poor road infrastructures and high costs of transportation and cold storage of fish made coastal fish very expensive for inland people. It was of course widely known in PNG that the distribution of the population of three and a half million people at the time (1980s) was that 84 percent of people live in inland areas and 24 percent live in coastal areas. The distribution of fish was the reverse; coastal fish stocks were abundant with a number of export based on commercial fisheries and thriving artisanal fisheries whilst freshwater fisheries was low, and limited to a few species. From 1984 to 1997 fish were introduced and stocked in the Sepik River system since fish surveys had been previously carried out by DPI. Adjacent to the Sepik River is the Ramu River system similar in its habitat and fish species composition. These two rivers become a single system in the lower reaches during flooding seasons. Together, the Sepik-Ramu has the largest catchment in PNG of approximately 96000 km2. The catchment supports a substantial inland population of at least one and a half million people. Following the fish surveys of the early 1980s, and with increasing awareness of the Sepik River system's potential to be improved to promote rural fish supplies through stocking, a decision was made by DFMR in 1984 to consider introductions. Stocking fish into rivers and lakes to initiate self-perpetuating fish stocks that are sustained by nature was attractive. Once fish populations establish after initial investment of finance, manpower and time, these fish can be managed sustainably with appropriate management strategies to sustain rural livelihoods. It was at the time, far easier technically, culturally, and financially to stock fish to meet the needs of a highly scattered rural population within the Sepik-Ramu River system. Having made the decision to introduce fish, the next issue was to decide on the kind of species to introduce, and how to introduce them properly. There was the need to consider what species were to be introduced in order to maximise benefits for the local people but minimise any interaction with the already existing fish in the Sepik River system. It was therefore decided that the Sepik fishery would be developed through fish introductions in an environmentally responsible manner. This was so that substantial increases in fish production can be achieved within the ecological framework of the river system to sustain and maintain the new introductions. At the technical capacity level, DFMR lacked both manpower and fish rearing facilities to carry through this decision. It was decided to get help from the Food and Agriculture Organization (FAO) and the United Nations Development Program (UNDP) in 1983. Through the assistance of FAO, the operational strategy on improving fish production in the Sepik basin was to apply internationally accepted precautionary approaches to fisheries development and the ICES/EIFAC Codes of Practice for the Introduction and Transfers of Aquatic Organisms. The ICES/EIFAC Codes of Practice, hereafter referred to as the Code of Practice provided the framework from which the project ideas were formulated to stock the Sepik-Ramu basin. In short, the Code of Practice describes the activities that should be done in advance of an introduction. This involves (1) desk research of the biology and ecology of the intended introduction; (2) preparation of detailed analysis of potential environmental impacts that includes socio-economic studies; (3) examination of the biology, ecology, and disease problems in its home range; (4) the submission of the results of such an evaluation to a competent authority for evaluation and decision. PNG used these steps to recommend fish species for introduction and transfer. In 1984, after DFMR requested assistance from FAO, an FAO mission prepared a project idea known as the Sepik River Fish Stock Enhancement Program (FI: FIRI/TRAM/2505). The project outlined the main problems and solutions to the low fish yield, high population density of the catchment, and proposed solutions. The Sepik River Fish Stock Enhancement Program (SRSEP) project was formulated to carry out the four steps of research in advance of an introduction that are described above. The long - term objective of SRSEP was to improve inland fishery production initially in the Sepik River basin Immediately the SRSEP needed to (i) determine existing fish stocks in the catchment area, both native and already existing introduced species, and determine basic fish species inter-relationships and potential vulnerability of native species to introductions; (ii) identify fish species for introduction into the Sepik River; and (iii) establish selected fish species to be introduced through stocking into the Sepik River. Following the need to apply a precautionary approach and establish appropriate decision making processes to the planned introductions, the work within the project was divided into two phases; (i) Phase 1: Evaluation of the potential benefits and risks of further fish species introductions and identify species suitable for introductions (years 1–3); and (ii) Phase II: Application of quarantine and stocking of suitable fish species as approved by appropriate authorities (years 4 and 5, plus an year 6 extension). A considerable technical evaluation was completed and presented to FAO (FAO 1993). The project concluded at the end of Phase 1 that stocking the Sepik River Basin was justifiable. The research provided a basis to include the Ramu River Basin for fish stocking. Finally, the benefits of stocking in relation to government policy were becoming more apparent. Under Phase 1, a number of key issues were resolved to allow the project to progress to Phase 2 with the guidance of the Code of Practice. The decision to stock both the Sepik and Ramu systems was made. Secondly, it was found that existing fish stocks were negligible at altitudes higher than 800 meters whilst population density increased with altitude. This meant that the PNG Highlands where the population is highest have very little fish in their cold-water streams. This led to the decision to stock cold-water fish in higher altitude streams of the Sepik-Ramu, the northern flowing rivers of the PNG Highlands. The target area and population under Phase 2 were to include higher altitude streams of the Sepik-Ramu basin that encompasses the following PNG Provinces; West Sepik, East Sepik, Madang, Eastern Highlands, Western Highlands and Morobe. The socio-economic situations in the communities vary but all were considerably poor. However, most communities live near and or around rivers or lakes and know how to fish. Their main activities are gardening, hunting, fishing and gathering. The target areas for stocking were identified to consist of (i) lowlands of the Sepik Ramu Basin below 100m (ii) mid-altitude rivers from lowlands to 800m (iii) and highlands, above 800m. The fish species to be introduced were proposed and in accordance to the Code of Practice assessed. An international panel of nine scientists from six different countries recommended the following fish species for introduction: 1) Tilapia rendalli, (2) Puntius gonionotus (java carp), (3) Osphronemus gouramy (giant gouramy), (4) Trichogaster pectoralis (snakeskin gouramy), (5) Prochilodus platensis, (6) Colossoma bidens (Pacu), (7) Schizothorax richardsonii (snow trout), (8) Acrossocheilus hexagonolepis (Chocolate mahseer), (9) Labeo dero and (10) Tor putitora (Tor). These fish were also scrutinised by the PNG Department of Environment and Conservation (DEC) and the Department of Agriculture and Livestock (DAL). All these fish have different habits to existing fish and previously introduced fish in the area. To cater for unseen problems with acquiring the above species, additional lists of alternate species were pre-evaluated for such a situation. The quarantine and environmental stocking strategies were also worked out. In order to protect PNG's native fish from potential diseases, the required quarantine of the fish was to be done overseas where feasible, as PNG's facilities and expertise in quarantining fish was limited. It was also concluded that after initial tests overseas, either eggs or small fry should be transported by air to PNG. These were raised to a small size and released as the Sepik-Ramu Rivers lack any large predator fish. Further, the facility overseas could maintain breeding stocks whereas PNG at the time lacked technical expertise in this area and the project staff had very specific work with a time frame to accomplish. Following these technical assessments, the government meetings took place to assess the reports and consider the recommendation to stock rivers in the Sepik-Ramu Basin. These were approved and in mid 1990, Phase 2 of the SRSEP went ahead. The project shifted focus from research evaluation as a primary focus to the stocking phase. The project imported, nine hundred Tilapia rendalli from the University of Stirling, Scotland, bred and continuously stocked this fish from November 1990 to November 1992. The tilapia were certified disease-free by the Institute of Aquaculture, at Stirling University and reared to breeding size in Madang. Puntius gonionotus was imported as eggs from Malaysia in January 1993 to be placed in quarantine in the Madang hatchery. However, DAL Quarantine refused the first trial shipment in 1991 from a stock in Irian Jaya because these were not pre-certified disease free. This was good in that it led to more dialogue and process to be worked out between DFMR, DEC, DAL and the Project. It also led to the understanding that live eggs could be imported and placed in quarantine, while overseas disease testing could be done on hatchlings for a period of time, at least for three months, before the fish were stocked. Forty feral adults of the giant gouramy were collected in Port Moresby by project staff and flown to the Madang hatchery. These were kept in the hatchery to grow to a breeding size. At the end of the project, these fish did not breed, and were later stocked in a remote lake in Middle Ramu. These introductions and stocking brought the Sepik River Stock Enhancement Program to a close in 1990. However, at the finalisation of Phase 2 of the Sepik River Stock Enhancement Program, the next project started to complete stocking of the ten approved fish species for introduction and transfer (two of those, Tilapia rendalli and Puntius gonionotus were already in the country). In 1990 and 1991 the PNG Government signed a follow-on agreement with UNDP in Port Moresby, to continue to stock fish species recommended in the Sepik River Stock Enhancement Program. This stocking was to be done in the floodplains, the mid-altitudes and higher altitude streams of the Sepik and Ramu River catchments. This was to affect a population of at least one and a half million people. The agreement was executed by UNDP and FAO through the Fisheries Improvement by Stocking at High Altitudes for Inland Development (FISHAID) project. 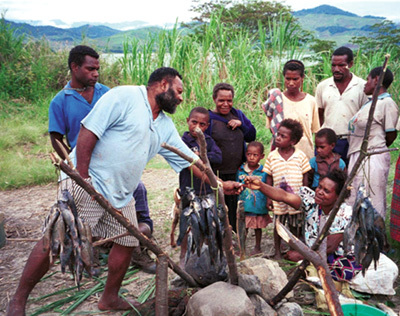 The PNG Government funded the field operation of the FISHAID project at a cost of approximately USD 1 million over the project period, 1993–1997 through DFMR with counter-funding from UNDP. The European Union (EU) countries also supported the project providing scientific and aquaculture technicians. Under the FISHAID project, the source countries for the fish species to be introduced were Brazil, India, Malaysia and Nepal. For cold water species a hatchery was built in Yonki in the Eastern Highlands Province. This hatchery was at an altitude of 1000 meters and was located away from any water body. A recirculating system using rainwater was collected and stored in aluminium tanks at the hatchery. A warm water hatchery in Madang had been built under the SRSEP project. This hatchery was at sea-level and was a re-circulating system using town water supply. The facility was in a bay on the beachfront and was near Madang airport. The fish that were imported under Phase 2 were snow trout, Tor and chocolate mahseer for cold-water environments, and Pacu and Prochilodus margravii (an alternate species) for the floodplains. All the fish were imported as eyed eggs and reared either at the cold-water hatchery in Yonki or in Madang. After hatching, and over a period of three months, samples of fish were sent to overseas laboratory in Malaysia and the United States for disease testing. When the results showed that no disease problems were present, fish of about 10g were packed in plastic bags filled with water and air and were transported to the site and released directly into the river or lake. Prior to placing an order for eyed eggs, the FISHAID Project had to request an import permit from the PNG Department of Environment and Conservation and the National Agriculture and Quarantine Inspection Service (NAQIA, formerly DAL Quarantine). The request stated the purpose of the import, the fish species for import, the live stage of import, the potential impact to native freshwater fauna and the quarantine facilities for the import, the source country of the fish and the PNG agency doing the import. On the form, it also stated that the responsibility for future impacts was on the importer, in this case, DFMR and later, NFA. Once an import permit was given, the EU project scientist travelled to the source country of the exotic fish species. In addition to logistical arrangements, the EU scientist had to travel to some source countries and facilities to make sure quarantine procedures were taught to source country facility staff. This was true of some countries where quarantine laws were not followed strictly. In other source countries, suppliers might lack the right types of transport equipment for live fish, or chemicals needed to apply basic quarantine procedures for eyed eggs. The project scientist supplied those facilities with what was needed to make imports easier. A lack of infrastructure support in raising broodstock in PNG implicated the use of overseas facilities to maintain the broodstock for the species snow trout, pacu, chocolate mahseer, Tor and Prochilodus. Except for Tilapia rendalli the project imported eyed-eggs from source facilities overseas. At the hatchery in Madang and Yonki, eyed eggs were incubated and raised to 10g of weight before being released into selected sites. During release, fingerlings were packed in plastic bags filled with oxygenated water. These were then either driven by road or flown by helicopter to remote high altitude streams or lowland lakes and streams, and released. Hatchery water was re-circulated and escape by fish into the environment was not an issue. The Madang hatchery was at sea level and next to the beach. All and any escapees would not have survived in the salt waters of the Bismarck Sea. The Yonki hatchery was built on a hill away from the Yonki Dam. Rainwater was used for the recirculating system. Escapees from the hatchery would have died immediately as there was no river or water body nearby. At the end of the project, the recirculating water systems were treated before release into the soil at Yonki and onto the beach at Madang. In the Sepik River Stock Enhancement Program, monitoring and management plans for the introduced species were included. The introduction was to be monitored by the NFA, as they were the importers of the exotic species. At the time, in 1997, the NFA was undergoing another legislative change to re-create a commercial institution out of NFA for the Government of PNG. Under this change, the NFA as a commercial authority was responsible of commercial fisheries and aquaculture. The way the 1998 Fisheries Management Act was written still made the NFA the sole management body for PNG's fisheries resources. This means in effect that fisheries development includes inland fisheries matters and inland fisheries development management is still under the responsibility of the NFA. Inland fisheries by this time was the sum of all the rural fisher folks collectively fishing many of the fish species introduced in earlier years by DASF, then DPI, then DFMR then NFA. Prior to the 1997 legislative changes, a law was ratified in 1996, giving power to the provincial governments to develop natural resources. Harmonization between the NFA legislation and the provinces are needed and can be worked out so that inland fisheries development has clear management directions from both the NFA and the provincial governments. Until such mechanisms are organized, the mandated authority in PNG for fisheries and aquaculture management remains the NFA. Therefore the NFA has to fulfil its legal obligations to re-assess the impacts of the FISHAID project. Its current operations make it even more possible to undertake such a basic government task. This means that NFA is still responsible for possible impacts of the fish introductions it approved from 1984 to 1997, although the resources are now growing and being fished under the legal authority of the provinces. The fish species introduced or transferred into the Sepik-Ramu are presented in Table 1. The table also shows the source countries and numbers of fish released during the FISHAID project. 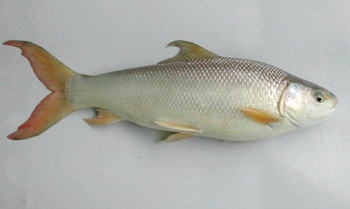 The introduced cold-water species were the Snow trout (Schizothorax richardsonii), Golden mahseer (Tor putitora) and the Chocolate mahseer (Accrossocheilus hexagonolepis). The cold - water species were introduced into high altitude streams of the Sepik and Ramu River sources covering the provinces Enga, Western Highlands, Simbu, Madang and Eastern Highlands. Warm-water fish species were introduced into Madang, and East Sepik Provinces. These were the Java carp (Puntius gonionotus), Emily's fish or Sabolo (Prochilodus margravii), Pacu (Piaractus brachypomum or Colossoma bidens), red Makau (Tilapia rendalli) and the giant gouramy (Osphronemus gouramy). The giant gouramy though was already introduced from Asia to PNG in previous years. From the original list of ten species, only eight were introduced or transferred. Labeo dero was not introduced and Trichogaster pectoralis was not transferred from Port Moresby to the Sepik-Ramu floodplains. Since the introductions nearly ten years ago, a number of species have established viable populations (Kolkolo, 2003; Mobiha, 2002). In the lowlands, the Java carp (Puntius gonionotus), Pacu (Piaractus brachypomum or Colossoma bidens), red makau (Tilapia rendalli) and Emily's fish (Prochilodus margravii) are growing throughout the floodplains of the Ramu and the Sepik Rivers. In the higher altitude streams, the snow trout (Schizothorax richardsonii), Tor putitora, now locally known as Tor and red makau (Tilapia rendalli) have established breeding populations. The status of two fish species remain unknown: the chocolate mahseer, Accrossocheilus hexagonolepis, and the giant gouramy, Osphronemus gouramy. The six species that were confirmed to be bred are contributing to rural food and income. The magnitude and extent of their distribution is not known until a proper fish surveys are done. However, the successful introduction has fulfilled the objectives of the Government of PNG through the two stocking projects; the Sepik River Stock Enhancement Program and the FISHAID projects. This success is due to the framework outlined in the Code of Practice, the people who undertook the project and the supporting financial and administrative arrangements of the implementing and executing agencies. The two projects put into effect the Code of Practice, and successfully moved live fish eggs across countries and continents to a developing country that previously had been unprepared to undertake such a project. In the final analysis, a Code of Practice is as good as the country, organization or group of people that follow the requirements. The PNG Government is a member of the United Nations and follows the FAO Code of Conduct for Responsible Fisheries. The Government also had the other legislated authorities such as Quarantine, Department of Environment and Conservation as well international conventions on the protection of the environment. The Government had similar procedures in place to assess introductions in agriculture and livestock. Because the Government supports responsible management of its natural resources, it was easier for DFMR to use the ICES/EIFAC Code of Practice for the 1994–1997 fish introductions. Even within a country where international codes of practice and conventions have been signed for responsible natural resource use and management, responsible actions may not necessarily happen if funding is not there. In the SRSEP and the FISHAID projects the funding was available by the Government of PNG and UNDP to make the Code of Practice work. The use of the Code of Practice requested not only funding but also project staff or individuals who believe in and accept principles as those of the Code of Practice. Technical and administrative competence of project leadership and implementation were very important for success. The question of whether or not these introductions were environmentally and socially successful has as yet to be answered by appropriate research. Many would argue that the 1984–1997 fish introductions were an experiment. The PNG Government has not yet carried out impact studies on the introduction and transfer of fish, The critical question is what are the environmental impacts associated with providing rural poor in the Sepik-Ramu Basin additional fish to eat daily within their subsistence means? In 1984, fish such as Anabas testudineus, the climbing perch, which was not native to PNG, either naturllay dispersed across the border or was carried by Irian Jaya refugees into the PNG Morehead and Fly River system. The climbing perch has now moved as far as Port Moresby. There are aquatic invasive plants such as Salvinia molesta and water hyacinth that have invaded entire river systems and lakes through accidental or irresponsible introductions and transfers. Has PNG addressed these introductions and transfers by impact assessments or management measures? The 1984–1997 fish introductions have made PNG even more aware of these issues. Since the last introduction in April 1997, there has been no monitoring of these species by the NFA. This includes actual environmental and social impact studies, fish stock surveys to determine the extent of the movements of fish, the population dynamics of the introduced species, the fishing pressures and related fisheries aspects. This was partly due to the fact that when the funding for the introduction lasted, work in the Sepik-Ramu system was possible. Since that time, no funding has been allocated to monitoring and follow-up of the work. The FISHAID project had made specific recommendations to the PNG Government on follow-up work. A review of the recommendations of the FISHAID Project in terms of further stocking is necessary. Importantly, the overdue issue of NFA policy towards inland fisheries development with the provinces to determine responsibility and action for inland fisheries development needs to be addressed. Through the 1984–1997 fish introductions, PNG now has the experience in using the ICES/EIFAC Code of Practice for responsible use of alien species and can build on this experience to assess future introductions and transfers or to use this experience to establish sound guidelines to manage current introduced and transferred species through appropriate legislations and policies. The protocols and guidelines of the Code of Practice are a reliable practical tool that, if followed adequately, ensures responsible introduction and transfer of alien species. The sections of the Code of Practice that made it a reliable tool include specific requirements for: (a) the country proposing to import exotic species to assess their own receiving environment, fauna and flora prior to considering an introduction or transfer; (b) the importing country to be clear about the consequences of an introduced species to its environments and the community; (c) a complete prospectus of the proposed species for introduction to cover both environmental and socio-economic risk aspects; (d) the exporting country to know its own native aquatic fauna prior to agreeing to allow another country to import the exotic species so it can provide advise to the importing country; (e) an assessment possible impacts of the exotic species on native species; (f) notification in advance as to which life stage the exotic species will be introduced; (g) a panel of expert technical advisors from the international community to approve the introduction; (h) the right facilities in-country to raise the exotic fish prior to release; (i) options to use source country facilities if the importing country lacks technical and infrastructural support; (j) a good import quarantine and environment organization; (k) communication links between all government authorities that have legal jurisdiction over introductions and transfers; and (l) the political and governmental legal system that supports the use of such codes of practice through affiliation with international conventions on environment and sustainable resource use. PNG did not have existing fish quarantine facilities which allowed the country to follow the guidelines of the Code of Practice. This code requests that the imported eyed eggs are raised to maturity and bred, and the first generation released in only a few selected streams. Monitoring their establishment and impacts are required before a full scale release is done. In the case of inadequate quarantine facilities the Code of Practice allows countries to use source country facilities for broodstock. It would be helpful for developing countries if the composition of the Expert Committee that considers introduction and transfer proposals had mechanisms that allow export and import country representation at the scientific, social and economic level. This would create, apart from the government prospectus, another independent set of discussions and recommendations on introductions and transfers within the Expert Committee. At the social level community representation would be necessary because communities and succeeding generations in communities remain at the sites of release and continue to depend on the resources of the rivers and lakes. Although they are the ones who may face negative impacts of the introduction the communities are often not involved in the decisions taken by their governments. At the scientific representation level, social issues should not only be evaluated by a fish biologist doing a socio-economic survey. 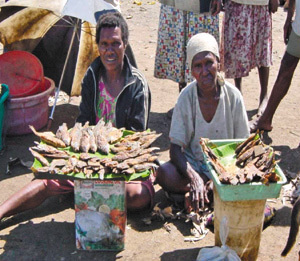 In the PNG experience, the socio-economic survey conducted by a fish biologist resulted in the assessment of how much money a rural fisher-folk can make after an introduction. The results of a socio-economic study by a social scientist are different and important. It would serve the community if a real social scientist was a member of the independent Expert Committee. The socio-economic impacts of introductions and transfers are equally important as biological and ecological impacts. The Papua New Guinea experience showed that socio-economic impacts should be part of any initial assessments leading to producing the prospectus of a selected species. However, socio-economic assessments, in addition to investigating incomes derived from fishing, should also include: (a) eating preferences of the receiving communities; (b) suitability of the introduced species to traditional preservation techniques used in receiving communities; (c) how the introduced fish species affect cultural trade systems and value system; (d) how the introduction affects gender roles and community structures; (e) what cultural roles do native species play in family relationships; and (f) economic viability of the proposed species in contrast to existing consumer species. The prospectus of each proposed exotic fish species should also include a budget for monitoring and an evaluation plan after an introduction and transfer has been completed.. After the introduction when all the funds were spent it was nearly impossible to assess “after introduction impacts”. However, at the prospectus stage of the Code of Practice, monitoring should already be planned and budgeted in order to make the Code of Practice even more effective. For poorer countries though this might be a barrier to use the Code of Practice. In developing countries such as PNG, basic biological, ecological, genetic or disease information hardly exists. International aid and conservation agencies can assist developing countries by maintaining genetic, disease, and impacts databases of well-known fish species that would provide information necessary for review of applications to introduce a new species. Workable tools such as these can assist the Code of Practice to be more useful for developing countries. The efficacy of the ICES/EIFAC Code of Practice depends on the technical, political and financial capacity of the developing country. Papua New Guinea's use of the Code of Practice was a success because, the political will was there. PNG was affiliated with UNDP and signed a number of international conventions relating to sustainable resource use. The quarantine laws for PNG in livestock were in place to keep DFMR and everyone else in line. In fact, the quarantine section of DAL will only allow “certified disease free fish imports” from Australia. With a government that promotes responsible management of natural resources, and established implementing organizations that keep those policies alive, it was easy for PNG to adhere to the requirements of the Code of Practice. Looking at the introduction now ten years down the line and having visited the PNG Highlands in 2001 and the lowlands of the Sepik-Ramu in 2002, the introductions have allowed a large number of rural people to have more and reliable access to fish (Kolkolo, 2003). Through the project PNG now has the experience and information on introductions, transfers and imported fish species. Though the information may be lacking in certain areas, there is more information available to assess future impacts. Further, the source countries and institutions of exotic species are known, so that any follow-up work can build on those contacts. The ICES/EIFAC Code of Practice should be broadened to include socio-economic impacts. Socio-economic studies should include cultural values and eating preferences and not just the type of socio-economics normally understood by fishery scientists, i.e. income from fishing. In addition to that, other useful instruments such as ongoing and updated databases of known fish species, biological, ecological, disease and genetic traits should be available to assist countries who wish to do an introductions or transfers. Now that six species have been confirmed to be growing and creating new fisheries for food and income for rural people, can inland fisheries be ignored in PNG? Impact assessments and monitoring might reveal answers to some of the questions about the Sepik-Ramu Basin. The National Fisheries Authority as the mandated authority for all fisheries and aquaculture matters in PNG can lead the way in all of this. Papua New Guinea used the ICES/EIFAC Code of Practice in the Sepik River Stock Enhancement Program and the FISHAID project to improve the fish production for the people living in the Sepik-Ramu system. These projects demonstrated that the Code is reliable and can be successfully used. Six alien species of fish have become established and are contributing to food and income in rural communities of the Sepik-Ramu Basin. The success of the Code of Practice was attributed first to the Government of Papua New Guinea's political will to to commit to international organizations, protocols, conventions and instruments that require responsible management and use of natural resources. Further, the Codes of Practice could be used because the government had established clear policy directions for inland fisheries development within its implementing agency, the Department of Fisheries and Marine Resources. It was also concluded that in developing countries, additional practical measures must be taken to ensure that responsible actions are being taken by both the source country of an exotic species and the importing country of the exotic species. This includes such things as basic quarantine procedures for treating live eggs for export, packaging and logistical transportation of live fish and even purchasing some of the packaging and other accessories and supplying those institutions that are supplying live fish. In accepting the expert advice of FAO to see inland fisheries policies become a reality, the Government of PNG took a risk. The risk was to allow FAO to implement the Code of Practice within a large part of its country, in catchment areas that were not well understood with the risk of facing future implications of this decision. The Code of Practice has useful and responsible protocols that countries can use for making introductions and transfers. However, its usefulness may be limited by the technical capacity of the user country and the source country of the exotic species. In PNG the limitations were: (i) scientific manpower to implement the requirements of the Code of Practice; (ii) the baseline databases of native fish species, habitats, and the environment of the importing country to make informed and realistic assessments of biological and environmental impacts; (iii) supporting infrastructure such as quarantine and fish hatcheries capable of producing the necessary numbers of fingerlings for introduction; (iv) political will to adopt the Code of Practice and to use it in the country; and (v) funding capacity to carry out the Code of Practice in country and in supporting source country deficiencies. These limitations were overcome and PNG followed an internationally accepted protocol for the responsible use of alien species to improve livelihoods in the the Sepik and Remu Rivers. The Food and Agriculture Organization of the United Nations (FAO) Rome, Italy, specifically, Dr. Devin Bartley, for inviting me to write about the fish introductions into the Sepik-Ramu Basin and making all the administrative arrangements. I also would like to thank the financial sponsors who willingly gave to make the workshop happen and Xiaowei Zhou of NACA for his assistance. Finally, to the University of Western Sydney, Australia for allowing for student leave time. The personal views and opinions expressed in this paper are the author's, and not that of the PNG Government, FAO, UNDP or the PNG National Fisheries Authority. Many of the things written outside of the Code of Practice or the FISHAID project were experiences through direct involvement as one of the DFMR scientists in the FISHAID project. FAO. 1993. Papua New Guinea. Sepik River Fish Stock Enhancement Project. Project Findings and Recommendations. Terminal Report. FI:PNG/85/001 Terminal Report. FAO, Rome. 33pp. FAO. 1995a. Precautionary approach to fisheries. Part I Guidelines on the precautionary approach to capture fisheries and species introductions. Elaborated by the Technical Consultation on the Precautionary Approach to Capture Fisheries (Including Species Introductions) Lysekil, Sweden, 6–13 June 1995. FAO Fisheries Technical Paper 350/1. FAO, Rome. FAO. 1995b. Precautionary approach to fisheries. Part II Guidelines on the precautionary approach to capture fisheries and species introductions. Elaborated by the Technical Consultation on the Precautionary Approach to Capture Fisheries (Including Species Introductions) Lysekil, Sweden, 6–13 June 1995. FAO Fisheries Technical Paper 350/1. FAO, Rome. FAO. 1997. Papua New Guinea. Fisheries Improvement by Stocking at Higher Altitudes (FISHAID) Project, Terminal Report. FI:PNG/93/007 Terminal Report. FAO, Rome.46pp. Kolkolo U. 2003. Possible Elements for a Future Project to Assess the Impact of the FISHAID Project in the Sepik and Ramu Catchments, Papua New Guinea, 2002. A Report prepared for the Food and Agriculture Organization, Rome, Italy. FAO Unpublished Field Report. Mobiha A. 2002. Report on the investigation into the introduced Pacu fish (Piaractus brachypomus, also sometimes called Colossoma bidens) within the middle and upper Sepik River and Ramu River Areas. National Fisheries Authority, Internal Report. Port Moresby, Papua New Guinea. Table 1. Summary of stock enhancement and fish release activities undertaken by the FISHAID project (from Coates: FAO, 1997). Fish were only released into rivers/lakes of the Sepik-Ramu River system including relevant areas of the highlands draining into these rivers (FAO 1997). Tilapia rendalli Red tilapia, “makau” Originally from Africa via the University of Stirling U.K. Only 900 imported, grown to broodstock, all those release were reared at Madang. 1.5 kg, aquatic vegetation, habits similar to existing tilapia (Oreochormis mossambicus) but different diet. Everywhere in catchment except fast flowing rivers. Prefers quiet backwaters with much vegetation and is quite tolerant of cold conditions. 173 111 52 widely dispersed locations throughout the catchment. Widely established. Contributing to an improved fishery in many locations. Highly regarded as food by local communities and preferred to the already existing tilapia (Oreochromis mossambicus). Doing very well in Yonki Reservoir, lower Sepik, middle and upper Ramu in particular. Although widely established it may take some time before the species spreads to all areas and stocks are built up to their optimum level. Osphronemus gouramy Giant gouramy Originally from Asia. Obtained from Brown River, Port Moresby, PNG. 7kg, aquatic vegetation, large air-breathing anabantid from Asia, prefers quiet waters. Lowland swamps and lakes. 37 adult fish Single remote lake in Middle Ramu. Not known. Breeding sized adults obtained from Port Moresby and breeding experiments commenced at Madang for local production. Did not breed in tanks (no ponds available) and fish released into river to make room for higher priority species. Trichogaster pectoralis Snakeskin gouramy Originally from Asia. Available vicinity of Port Moresby. 0.5kg omnivorous feeding on insects and a variety of plant, prefers quiet waters. Lowland swamps and lakes. - - No stocks released. Efforts were devoted to higher priority and more difficult species from overseas. Supposed to be done at a later stage by DFMR. Puntius gonionotus Java carp University Pertanian Malaysia. 1.5kg omnivorous feeding on plant matter and aquatic insects etc., small Asian barb/carp, inhabits large range of habitats. Everywhere, especially lakes and relatively slow-flowing rivers. 27750 8 different sites especially lower Ramu at Bunapas, middle Ramu at Brahman and middle Sepik at Bunam. Known to be established at Brahman, Bunapas and Bunam where it is already contributing to an improved fishery. Releases of this fish were halted in 1993 in order to give priority to other species, which were more difficult to procure and stock. Broodstock were placed at the governmental fish farm at Aiyura where they were supposed to be raised and a domestic breeding programme started which would continue the necessary stocking. These fish bred in 1995/6 but no attempts were made to compensate for the necessary stocking requirements. Although established the fish will take a long time to disperse. Further stocking required, including into Yonki reservoir. Prochilodus margravii P.N.G. name “Emily's fish” Sao Francisco River, Brazil via CEPTA/IBAMA 6kg exclusively detritus (mud), a larger S. American characin renowned for its jumping ability and long migrations along rivers, feeds on floodplain and spawns in tributary rivers, high oil content in flesh. Lowland floodplain and lakes but migrates in large schools up tributary rivers. 160511 Middle Sepik (especially Chambri Lake and Bunam) and middle and lower Ramu. Not expected to breed until 1999. A few fish have been caught at least at Bunam where the fish is preferred to all others (one community report says that it was even superior to tinned mackerel). Monitoring required to determine success. This species, if established successfully, is anticipated to become one of the most abundant species in lowlands. Biological production may exceed 50,000 tones per annum. Colossoma bidens / Piaractus brachypomum P.N.G. name “Pacu” University of Pertania Malaysia, originally from Brazil 35kg exclusively vegetarian eating fruits and nuts in flooded forest, large teeth able to crack open rubber tree nuts, inhabits forested areas and migrates up rivers to spawn. Lowland lakes and flooded forest. 14511 Remote lakes in middle Sepik and middle and lower Ramu. Not expected to breed until 1999. More stocking required. This fish also has significant aquaculture potential in P.N.G. It grows very fast, is highly prized and feeds on wastes from commercial plantations (including coffee, coca palm and copra wastes). Broodstock of this species were re Madang to within one year of breed size. Most of these were dumped in Ramu River at the closure of the palm due to lack of commitment interest NFA in any follow-on activities. Tor putitora Golden Mahseer Nepal and India 80 kg omnivorous -mainly aquatic insects, a large Asian cyprinid (carp) renown in its native range as a highly prized sport fish, now threatened there due to over-fishing. In addition to its food fish qualities the fish may form the basis of a tourism sportfish industry. Fast flowing rivers at mid-altitudes including highlands. 29827 9 different locations -chiefly Yonki Reservoir but also rivers in middle Sepik. Not expected to breed until 1999. Doing well in Yonki reservoir where growth rates are better than expected. It is difficult to obtain large stock numbers of this fish. Placed in the Yonki Reservoir breeders can be collected at a later date in order to start the domestic breeding programme. Acrossocheilus hexagomolepis Chocolate Mahseer Nepal 5.0 kg omnivorous -mainly aquatic insects, a medium sized Asian cyprinid (carp) with similar habits to Tor putitora. Fast flowing rivers at low and mid-altitudes. 11224 9 different locations -chiefly Yonki Reservoir but also rivers in middle Sepik. Not expected to breed until 1999. Stocks of this fish difficult to obtain large numbers. Placed in Yonki Reservoir so breeders can be collected later date so domestic breeding programme can be started. Schizothorax richardsonii Snow trout Nepal and India 2 kg juveniles omnivorous, adults exclusively vegetarian -feeding algae, lives in clear fast flowing streams, rivers with water temperatures from 10 to 27°C. Habits similar to ordinary trout except for feeding and improved temperature tolerance. An important species in catches in its native range. Fast flowing rivers at higher altitudes. 70309 40 different sites at high altitudes inc. Western Highlands, Enga, Eastern Highlands, East Sepik and Madang Province. Not expected to breed until 1999. This is the most important species found in highland areas. Estimated to be more suitable for P.N.G. coldwater rivers that the “normal” (salmonid) trout. More stocking required. The extent to which this species dispenses needs to be determined by future research monitoring. Due to limited supply of stock only a small part of the catchment was released near Kainantu and Bundi. Broodstocks of this species were released near Yonki within six months of breeding age. These were dumped into the Ramu River at the closure of the project; lack of interest in follow-on activities. Labeo dero Nepal India 2 kg vegetarian especially algae in streams, habits similar to snow trout. Fast flowing rivers at higher altitudes. - Not stocked. Proved to be difficult to obtain it from India/Nepal, species put on hold until results from snow trout introductions are available.